My one month late Eid present for everyone. I finished translating this some weeks ago, but I’m really busy these days so I didn’t have the time to finish proofreading and editing till now. (It took me 10h40minutes to translate this interview. Plus 7h30 of editing,proofreading, googling information and watching episodes again to better remember what they’re talking about and take screenshots. It’s 8 pages and around 13 700 characters. I did a quick comparison with an example: Madan no Ou volume 13 got an average of 297 characters per page and is around 480 pages without counting the illustrations and titles. This means it has around 142 560 characters. Meaning it’d take me 104 hours to translate it all. Let’s say 70 hours because it won’t be as complicated as translating a dialogue between 3 people. I don’t feel like getting money by picking a new LN that’s popular and ask donations to translate it, but even if I wanted to, it’d still take me too much time. I still have a long way to go. I’m not saying all this to complain btw, the main reason I do these translations is for myself. )You should read Madan no Ou it’s very good. 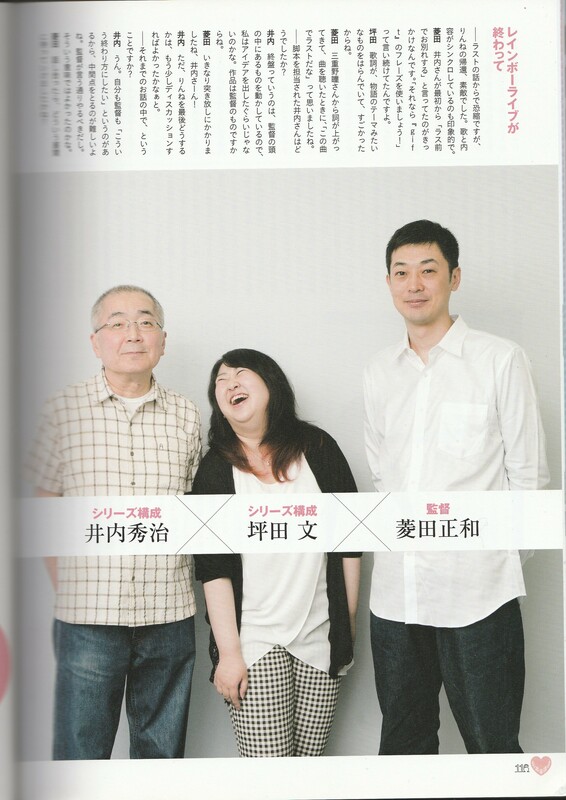 This time Iuchi san is here too compared to the interview in the Rainbow Live Guidebook. So it’s a dialogue with 4 people if you count the interviewer. I had to reformulate a lot so it makes sense in English, as the Japanese way of speaking is different. And I needed to be careful to keep the original nuances, and to not make confusing sentences. I put red for Tsubota Fumi because she’s the one who wrote most of Bell, and purple for Iuchi Shuji because he’s the one who wrote most of Ito and Kouji. The big titles are the titles of each part of the interview. Those are in every interviews, but I usually don’t include them because they just paraphrase what they say. Here, I included them to indicate they will change subjects. Unlike other interviews, they change topics without the interviewer prompting them. Hishida Masakazu is Pretty Rhythm’s director. Iuchi Shuji worked as scriptwriter on all three seasons, and on series composition in DMF and RL. Meaning he wrote the core of the story/scripts with the director, Akao Deko and Tsubota Fumi. Akao Deko was the main series compositor above Iuchi Shuji on Aurora Dream and Dear My Future. 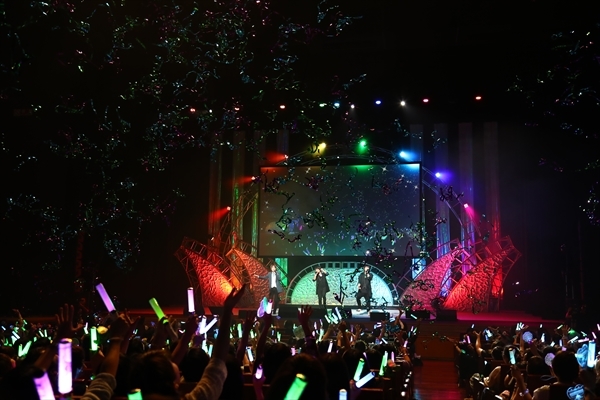 But for Rainbow Live, she only wrote the songs’ lyrics, and Tsubota Fumi did series composition with him instead. Tsubota Fumi worked as scriptwriter on Aurora Dream and Dear My Future and as series composition on Rainbow Live. Tsubota Fumi used to be in a theater troupe, writing theater pieces before starting to work as an anime script writer. It’s thanks to her they got the idea to make Grateful Symphonia into a theater piece, and she wrote all the scripts of Dear My Future from episode 47 to 51. She still works on theater pieces, drama and live action shows from time to time. I also included the small storyboard excerpts present in the interview, the photos of the trio, and the same episode screenshots as the ones in the interview,+ a few more. I tried to put them in the same locations as in the book too. My own comments are under parenthesis. This entry was posted in Opinions on..., Pretty Rhythm and tagged Ageha Mia, Akaii Meganee, Akao Deko, Akesaka Satomi, Amamiya Rizumu, Amamiya Ryuutarou, Amou Juné, Anime, Aoi Shouta, Aoyama Touko, Asada Nikki, Asechi Kei, Asechi Kyouko, Asumi Kana, Ayase Naru, プリティーリズム, プリリズ, Bearchi, Callings, Chae Kyoung, Chiba Shigeru, Chiba Susumu, Denpagumi, Don Bombie, Enoki Azusa, Fujita Yoichi, Fukuhara An, Gotou Saori, Hara Sayuri, Harune Aira, Harune Eru, Harune Hiroshi, Harune Itsuki, Harune Omi, Harune Uru, Hatanaka Tasuku, Hatano Wataru, Hayami Hiro, Hayamizu Risa, Hidaka Noriko, Higarashi Masashi, Himuro Hijiri, Hishida Masakazu, Hye In, Itou Kanae, Iuchi Shuji, Jae Eun, Jounouchi Serena, Kakihara Tetsuya, Kanzaki Sonata, Kato Emiri, Katou Daisuke, KENN, Kim Hyang Ri, KING OF PRISM by PrettyRhythm, Kinpri, Kojima Nobuto, Komatsu Mikako, Kondou Takashi, Kumai Motoko, Kurisu Kaname, Kurokawa Rei, Kurosaki Maon, Kuwashima Houko, Kyougoku Takahiko, Madou Ou Granzort, Maeno Tomoaki, Mashin Eiyuuden Wataru, Masuda Toshiki, Mieno Hitomi, Mihama Kouji, Miki Shinichiro, Mishiru, Miyake Kenta, Miyake Marie, Miyama Reina, Morizono Wakana, Moshi Watashi Ga Hoshitsuki Hikari Dattara, Murakami Momoko, Nagasaki Yukio, Nagatsuka Takuma, Nakamura Hayato, Namikawa Daisuke, Nanri Furea, Nekochi, Nishi Hiroko, Nishina Kazuki, Norizuki Jin, Ojamajo Doremi, Okama, Okamoto Nobuhiko, Ookubo Rumi, Ooruri Ayami, Otobe Yoshihiro, Penguin sensei, Pretty Rhythm, Pretty Rhythm Aurora Dream, Pretty Rhythm Dear My Future, Pretty Rhythm Miniskirt, Pretty Rhythm Rainbow Live, Pripara, Rabichi, Renjouji Bell, Rinne, Saitou Souma, Sakuma Rei, Sakura Ayane, Saori Goto, Segawa Onpu, Seki Toshihiko, Serizawa Yuu, Shi Yoon, Shibata Risa, Shijimi Karin, Shishido Rumi, Shou, Showtaro Morikubo, So Min, Soumi Yoko, Sugita Tomokazu, Suzuno Ito, Takamine Anna, Takamine Mion, Takamine Pietro, Takamori Natsumi, Takanashi Otoha, Takayama Minami, Takeuchi Shunsuke, Takigawa Jun, Terashima Junta, Tomatsu Haruka, Toudou Hibiki, Toudou Kanon, Tsubota Fumi, Tsuda Minami, Uchida Maaya, Uchida Yuuma, Watanabe Akio, Wataru, Yamao Yamada, Yamazaki Moe, Yashiro Taku, Yoda Takeshi, Yonezawa Madoka, Yong Hwa, Yuasa Kaede, Yunsu on October 13, 2016 by rockmanshii. Inexhaustive list of the magazines with Pretty Rhythm related content, just copypasted them from my news posts. It’s just so if I ever have the money to buy them I won’t have to read each one of my posts again to find which magazine had what. Then I thought I’d share it.I try to update this list whenever making a new Pretty Rhythm news post. This entry was posted in Opinions on..., Pretty Rhythm and tagged Ageha Mia, Akaii Meganee, Akao Deko, Akesaka Satomi, Amamiya Rizumu, Amamiya Ryuutarou, Amou Juné, Anime, Aoi Shouta, Aoyama Touko, Asada Nikki, Asechi Kei, Asechi Kyouko, Asumi Kana, Ayase Naru, プリティーリズム, プリリズ, Bearchi, Callings, Chae Kyoung, Chiba Shigeru, Chiba Susumu, Denpagumi, Don Bombie, Enoki Azusa, Fujita Yoichi, Fukuhara An, Gotou Saori, Hara Sayuri, Harune Aira, Harune Eru, Harune Hiroshi, Harune Itsuki, Harune Omi, Harune Uru, Hatanaka Tasuku, Hatano Wataru, Hayami Hiro, Hayamizu Risa, Hidaka Noriko, Higarashi Masashi, Himuro Hijiri, Hishida Masakazu, Hye In, Itou Kanae, Iuchi Shuji, Jae Eun, Jounouchi Serena, Kakihara Tetsuya, Kanzaki Sonata, Kato Emiri, Katou Daisuke, KENN, Kim Hyang Ri, KING OF PRISM by PrettyRhythm, Kinpri, Kojima Nobuto, Komatsu Mikako, Kondou Takashi, Kumai Motoko, Kurisu Kaname, Kurokawa Rei, Kurosaki Maon, Kuwashima Houko, Kyougoku Takahiko, Madou Ou Granzort, Maeno Tomoaki, Mashin Eiyuuden Wataru, Masuda Toshiki, Mieno Hitomi, Mihama Kouji, Miki Shinichiro, Mishiru, Miyake Kenta, Miyake Marie, Miyama Reina, Morizono Wakana, Moshi Watashi Ga Hoshitsuki Hikari Dattara, Murakami Momoko, Nagasaki Yukio, Nagatsuka Takuma, Nakamura Hayato, Namikawa Daisuke, Nanri Furea, Nekochi, Nishi Hiroko, Nishina Kazuki, Norizuki Jin, Ojamajo Doremi, Okama, Okamoto Nobuhiko, Ookubo Rumi, Ooruri Ayami, Otobe Yoshihiro, Penguin sensei, Pretty Rhythm, Pretty Rhythm Aurora Dream, Pretty Rhythm Dear My Future, Pretty Rhythm Miniskirt, Pretty Rhythm Rainbow Live, Pripara, Rabichi, Renjouji Bell, Rinne, Saitou Souma, Sakuma Rei, Sakura Ayane, Saori Goto, Segawa Onpu, Seki Toshihiko, Serizawa Yuu, Shi Yoon, Shibata Risa, Shijimi Karin, Shishido Rumi, Shou, Showtaro Morikubo, So Min, Soumi Yoko, Sugita Tomokazu, Suzuno Ito, Takamine Anna, Takamine Mion, Takamine Pietro, Takamori Natsumi, Takanashi Otoha, Takayama Minami, Takeuchi Shunsuke, Takigawa Jun, Terashima Junta, Tomatsu Haruka, Toudou Hibiki, Toudou Kanon, Tsubota Fumi, Tsuda Minami, Uchida Maaya, Uchida Yuuma, Watanabe Akio, Wataru, Yamao Yamada, Yamazaki Moe, Yashiro Taku, Yoda Ken, Yonezawa Madoka, Yong Hwa, Yuasa Kaede, Yunsu on October 13, 2016 by rockmanshii. It was announced the 15th September, first day of TGS2016. Game is titled “VRフォトセッション from KING OF PRISM by PrettyRhythm” and a demo is currently playable at the VR game corner of TGS2016. It will release next spring (early 2017) on Playstation VR, and this winter(2016) on iOS and Android. Seems it’s being developed by a company called CS-REPORTERS.INC. The game’s story is about how a pro cameraman (the player) was commissioned by Edel Rose to take pictures of Over The Rainbow for a photo collection of the group. It’ll be released at the same time as a photo collection of Schwarz Rose, and you must help Edel Rose sell more than it’s rival. The Prism Star cadet Shin also joins in. You must guide Over The Rainbow to victory with your photography skills! This is pretty funny and sounds like something PR director would write. Currently confirmed characters in the game are Hiro Kouji Kazuki and Shin. They also announced a handshake&photo meet event to celebrate the game’s announcement. The event is titled “握手会＆撮影会 from KING OF PRISM by PrettyRhythm” and this is the logo. Event will be this fall, they haven’t given out an actual date yet. Judging from this, seems they won’t add any other character but not loosing hope. They’ll use the VR game and tech to try and do a handshake event with the characters themselves, the seiyuus won’t be present. I guess this will be another thing the Pretty Rhythm franchise is the 1st to do? Or at least to popularize. Ouenjoueis weren’t invented by Pretty Rhythm, and some of the staff said they may have been inspired by Nanoha movie screening concerts, but I’m sure tons of other movies will do ouenjoueis too after seeing how Kinpri became a social phenomenon partly thanks to them. If this VR handshake event is successful I’m sure other franchise will start doing it too. Gotta say I definitely didn’t see this coming. I haven’t seen this in any english written news sites, so when I saw pics of it on twitter, I didn’t bother reading about it. Just thought it was some kind of VR tech demo collab with Kinpri at TGS. It’s an actual game project!!! It’s kinda weird Crunchyroll or ANN haven’t reported about it yet. But I guess if PR related things were covered enough in English speaking media to satisfy me, I wouldn’t do these posts in the 1st place. Crunchyroll especially has been keeping good track of Pretty Rhythm news ever since Kinpri started and the franchise getting much more popular, so it’s weird. I kinda wish some English news site would report about it because I have trouble believing what I’m reading and wondering if I may be wrong. We’re getting an actual Pretty Rhythm console game!!! This is super big news!!! Even if it’ll probably turn out to be a take pictures game with minimal gameplay. If they add more characters, or even the girls too it’ll be really great. Really looking forward to how this will turn out. I don’t think I’ll spend hundreds for a Playstation VR just for one game though. Kinpri VR is the only game I 100% want to try so far. There’s stuff like Summer Lesson and Argyle Shift that seems interesting to me, but I’m waiting to see how they’ll turn out at release. I don’t really believe in Playstation VR or Oculus Rift stuff, and everything I’ve seen of it so far doesn’t interest me. Waiting to see if it’ll get any genuinely interesting games and how the games will be gameplay wise etc. You can find more pics of the game here. This entry was posted in Opinions on..., Pretty Rhythm and tagged Ageha Mia, Akaii Meganee, Akao Deko, Akesaka Satomi, Amamiya Rizumu, Amamiya Ryuutarou, Amou Juné, Anime, Aoi Shouta, Aoyama Touko, Asada Nikki, Asechi Kei, Asechi Kyouko, Asumi Kana, Ayase Naru, プリティーリズム, プリティーリズム女児用パンツ, プリリズ, Bearchi, Callings, Chae Kyoung, Chiba Shigeru, Chiba Susumu, Denpagumi, Don Bombie, Enoki Azusa, Fujita Yoichi, Fukuhara An, Gotou Saori, Hara Sayuri, Harune Aira, Harune Eru, Harune Hiroshi, Harune Itsuki, Harune Omi, Harune Uru, Hatanaka Tasuku, Hatano Wataru, Hayami Hiro, Hayamizu Risa, Hidaka Noriko, Higarashi Masashi, Himuro Hijiri, Hishida Masakazu, Hye In, Ichijo Shin, Itou Kanae, Iuchi Shuji, Jae Eun, Jounouchi Serena, Kakihara Tetsuya, Kanzaki Sonata, Kato Emiri, Katou Tome, KENN, Kim Hyang Ri, King Of Prism by Pretty Rhythm, KING OF PRISM by PrettyRhythm, King of Prism Pride the Hero, Kinpri, Kojima Nobuto, Komatsu Mikako, Kondou Takashi, Kumai Motoko, Kurisu Kaname, Kurokawa Rei, Kurosaki Maon, Kuwashima Houko, Kyougoku Takahiko, Maeno Tomoaki, Masuda Toshiki, Mieno Hitomi, Mihama Kouji, Miki Shinichiro, Mishiru, Miyake Kenta, Miyake Marie, Miyama Reina, Morizono Wakana, Moshi Watashi Ga Hoshitsuki Hikari Dattara, Murakami Momoko, Nagasaki Yukio, Nagatsuka Takuma, Nakamura Hayato, Namikawa Daisuke, Nanri Furea, Nekochi, Nishi Hiroko, Nishina Kazuki, Norizuki Jin, Ojamajo Doremi, Okama, Okamoto Nobuhiko, Ookubo Rumi, Ooruri Ayami, Otobe Yoshihiro, Penguin sensei, Pretty Rhythm, Pretty Rhythm Aurora Dream, Pretty Rhythm Dear My Future, Pretty Rhythm Miniskirt, Pretty Rhythm Rainbow Live, Pripara, Rabichi, Renjouji Bell, Rinne, Saitou Souma, Sakuma Rei, Sakura Ayane, Saori Goto, Segawa Onpu, Seki Toshihiko, Serizawa Yuu, Shi Yoon, Shibata Risa, Shijimi Karin, Shishido Rumi, Shou, Showtaro Morikubo, So Min, Soumi Yoko, Sugita Tomokazu, Suzuno Ito, Takamine Anna, Takamine Mion, Takamine Pietro, Takamori Natsumi, Takanashi Otoha, Takayama Minami, Takeuchi Shunsuke, Takigawa Jun, Terashima Junta, Tomatsu Haruka, Toudou Hibiki, Toudou Kanon, Tsubota Fumi, Tsuda Minami, Uchida Maaya, Uchida Yuuma, Watanabe Akio, Wataru, Yamao Yamada, Yamazaki Moe, Yashiro Taku, Yoda Takeshi, Yonezawa Madoka, Yong Hwa, Yoshida Shoichi, Yuasa Kaede, Yunsu, 吉田昇一 on September 15, 2016 by rockmanshii. 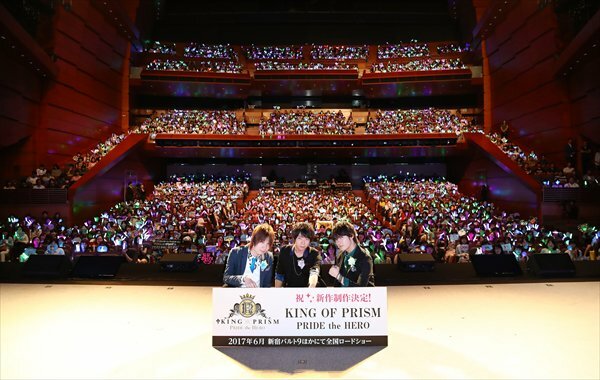 Was announced at the end of the KING OF PRISM Over The Rainbow SPECIAL THANKS PARTY on September 11 2016. It’ scheduled for June 2017, no specified day yet. It’ll premiere in Wald 9, the same cinema Kinpri 1 debuted at. Announcement on the official site is here. It doesn’t say anything else. There’s no preview video yet either. I’m super happy and really hyped, but also kinda disappointed because I definitely thought they would first do a 1 cour late night TV anime for January 2017, and then a movie for June 2017. Guess I was too optimistic. And maybe director is too busy with Fairuru. Because unless the movie is 2hours long I don’t think they’ll have the time to put in CG performances for each Edel Rose boy with their personal song, so that’s why I thought they’d make a TV anime at first to show them. Every Pretty Rhythm series has their time based on real life time. They don’t necessarily happen in the same year, but time flows the same. For example, AD, DMF and RL each take place over a year, and they all aired for a year. Kinpri takes places one year and a half after the end of RL, and it was released one year and a half after RL ended. So if they had made a tv series in January 2017, normally it should take place one year after Kinpri’s story ended. But by then it would be too far away and maybe Prism King Cup would have already happened since it’s supposed to be soon. So I thought the TV series could have been about flashbacks about what each character did since the end of Kinpri. It would have complemented all the various stories written by Director in magazines. That way they wouldn’t have had to worry about how each episode leads to the next too. It would have been episodic. Maybe we could have even got an episode about Kouji in America. But yeah that’s not happening sadly. In any case, if the new movie still follow that rule, since it’s releasing in June 2017, one year and a half after Kinpri was released, it means the new movie’s story should also take place one year and a half after Kinpri ended. Which means that it would be even far away so maybe Prism King Cup would have happened already, so I guess they won’t make it happen that far away in time. Or maybe they’ll just say the Prism King Cup still haven’t happened then. If there is indeed a timeskip, maybe some of the characters will change designs again. Maybe they’ll skip the qualifications tournaments for the Prism King Cup and only show the cup itself. Maybe Kouji already came back by then etc. Lotsof different things can happen. Really excited. In any case seeing the movie’s subtitle, seems Hiro will play a big part in the story. I still think he’ll sing Happy Naru since he won’t be able to sing Pride at first and want to sing a Kouji song at all costs. Still think Shin will play a big role in making Jin make up with hijiri too. Event was at Tokyo International Forum, Hall C. They did it twice the same day so more people can go. First at 14:30, called “noon division”, then at 19:00, called “evening division”. Even was in two halves. First half of the event was an ouenjouei. Second half was a talk show with Over The Rainbow’s seiyuus Kakihara Tetsuya, Maeno Tomoaki and Masuda Toshiki. The Kinpri sequel announcement was at the end of the “noon division”. They probably announced it again at night too. I’m not sure if they said the exact same things during the talk show at noon and at night. The hall can hold 3000 people and was sold out. Furthermore it was streamed live in 82 cinemas across Japan, and 3 cinemas in Korea. What they call “live viewing”. Around 20000 people watched the event in total. Like all the different messages at the previous ouenjoueis, before the movie started there was a new message from the characters at the beginning. Once the ouenjouei ended, the talk show started. During it they also showed scenes from the movie, with the seiyuus doing them on stage. For example they showed the Tokimeki Cycling jump and the seiyuus appeared on bicycle on stage as well. 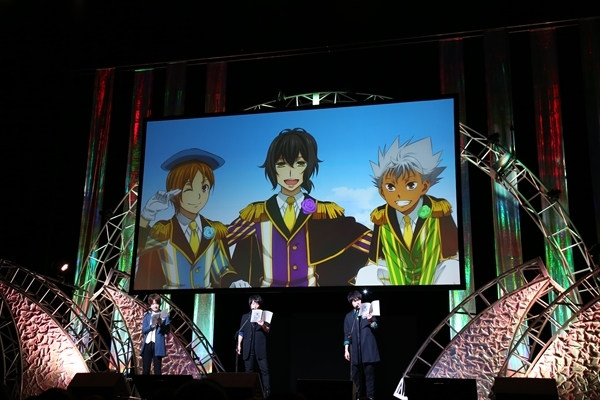 In the corner “With love from Obare: cheering message” the 3 seiyuus acting as their characters, gave message of thanks to the audience for supporting them until now etc. It was particularly impressive when Masuda Toshiki screamed BURNING and all the audience screamed BURNING too. Edi: I found this fanart of their message. 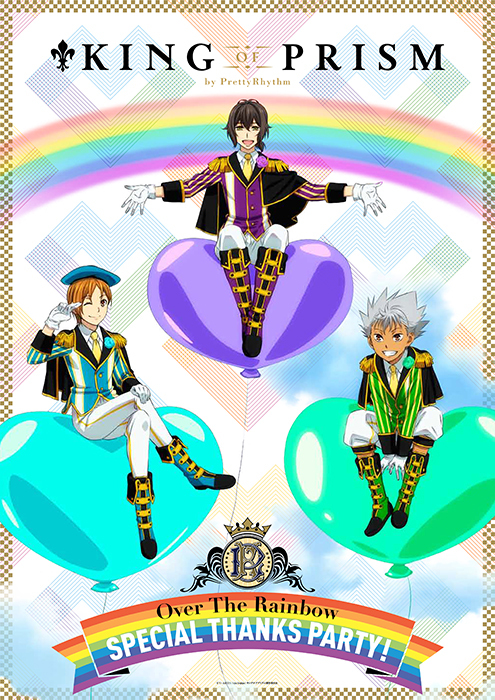 They were in their Kinpri designs, meaning the message in universe was during/after Kinpri, so yeah seems Rinne really did come back momentarily. Then the announcement corner started. Kinpri will participate in the event Anime JAM 2016 the 10th and 11th of December 2016. Announcement on the event’s official site. Kinpri seiyuus will appear the 10th only, during the “Rock stage”. The five participating seiyuus will be Terashima Junta/Shin, Hatanaka Tasuku/Taiga, Igarashi Masahi/Minato, Nagatsuka Takuma/Leo and Takeuchi Shunsuke/Alec. Kinpri will get its own web radio show. The podcasts will be published on Hibiki Radio. Further details like who the radio hosts are will be published later. After these announcements, the seiyuus acted on stage a story written by PR director called “Over the Rainbow mune kyun Jump from backstage”. Basically a drama CD live. The video they showed got uploaded on Youtube by Avex. “I won’t be able to sing Kouji’s songs anymore?” Obviously said by Hiro. “I thought he had statuses” The kanji used there is 格/Kaku, so this is definitely Jin speaking. My bet is that’s what he’ll say describing Louis when revealing to the characters he works with him. He’ll say Louis is a bishonene that reminds him of himself when younger and he’s a man of statuses, unlike commoners like Hijiri, Hiro or Kouji. “This is Norizuki Jin’s way of doing things”. Probably Hiro or Hijiri, commenting on how Jin stole Pride for Louis to use. “The way you are right now, I don’t want you to sing Pride!” The way the sentence is phrased makes me think this is Kouji speaking. Kouji ends his negative phrases like that. He’s probably speaking to Hiro. Meaning Hiro will do something bad? 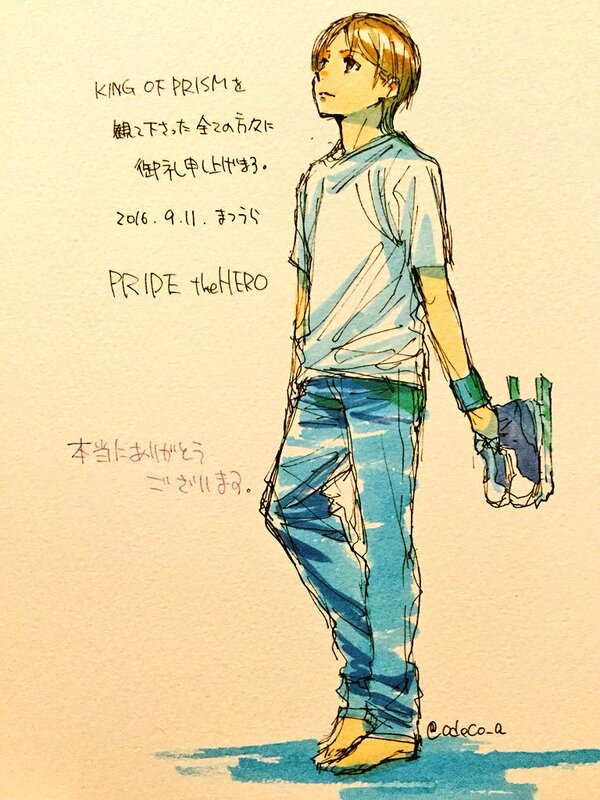 Maybe Kouji will say he’s disappointed that Hiro’s depressed for not singing Pride and that even if Hiro had the rights to sing it, Kouji wouldn’t like it. “Hijiri! I have gotten hold of everything!” This is obviously Jin speaking to Hijiri. “I respected my big brother. I wanted to become like my big brother one day” This is obviously Hijiri speaking about Jin. They’ll finally show a flashback of Hijiri and Jin’s childhood, when Maria died and Hijiri started living with Jin and Kou. This may mean Hijiri started doing Prism Shows competitively because Jin was doing it. This would mean Jin’s inferiority complex toward Hijiri is something he accidentally started up himself. Also this means Jin was nice toward Hijiri when they were kids. Then OTR got back on stage with Athletic Core starting to play for the 1st time in the event. They sang together with the audience, doing calls to the audience to sing. Maeno san said “Whether you’ve been supporting us since Pretty Rhythm, or whether you started with Kinpri, I will be happy if you keep supporting us”. Washizaki Takeshi who I think was MC’ing the event. Tweeted this pic with the 3 seiyuus once the event ended. CG Director said “look forward to more mind boggling Prism Shows”. Kato Emiri/Naru tweeted she was happy to see the other Rainbow Live seiyuus again when they recorded the message together. She also congratulated everyone for the new movie and said she’s looking forward to it. Masuda Toshiki/Kazuki posted on his blog how the event was 2hours long of fun, HE GOT TO BURNING, for the first time in a while, FREEDOM, etc. Komatsu Mikako/Ito said she was very happy recording the message and Ito was super dere dere cute, and she wonders if Ito’s hair will get even longer in the new movie. This person who often does papercraft of the characters went to the event with a Rinne paper. After the event, Director tweeted how they announced the 1st Kinpri movie last year in a room with 200 people and now they announced the sequel in a room with 20 000 people and a miracle really happened. Also the pamphlet distributed at the event had him saying that if you like Kinpri please also watch the rest of Pretty Rhythm starting with Aurora Dream. This entry was posted in Opinions on..., Pretty Rhythm and tagged Ageha Mia, Akaii Meganee, Akao Deko, Akesaka Satomi, Amamiya Rizumu, Amamiya Ryuutarou, Amou Juné, Anime, Aoi Shouta, Aoyama Touko, Asada Nikki, Asechi Kei, Asechi Kyouko, Asumi Kana, Ayase Naru, プリティーリズム, プリティーリズム女児用パンツ, プリリズ, Bearchi, Callings, Chae Kyoung, Chiba Shigeru, Chiba Susumu, Denpagumi, Don Bombie, Enoki Azusa, Fujita Yoichi, Fukuhara An, Gotou Saori, Hara Sayuri, Harune Aira, Harune Eru, Harune Hiroshi, Harune Itsuki, Harune Omi, Harune Uru, Hatanaka Tasuku, Hatano Wataru, Hayami Hiro, Hayamizu Risa, Hidaka Noriko, Higarashi Masashi, Himuro Hijiri, Hishida Masakazu, Hye In, Ichijo Shin, Itou Kanae, Iuchi Shuji, Jae Eun, Jounouchi Serena, Kakihara Tetsuya, Kanzaki Sonata, Kato Emiri, Katou Daisuke, KENN, Kim Hyang Ri, King Of Prism by Pretty Rhythm, KING OF PRISM by PrettyRhythm, King of Prism Pride the Hero, Kinpri, Kojima Nobuto, Komatsu Mikako, Kondou Takashi, Kumai Motoko, Kurisu Kaname, Kurokawa Rei, Kurosaki Maon, Kuwashima Houko, Kyougoku Takahiko, Maeno Tomoaki, Masuda Toshiki, Mieno Hitomi, Mihama Kouji, Miki Shinichiro, Mishiru, Miyake Kenta, Miyake Marie, Miyama Reina, Morizono Wakana, Moshi Watashi Ga Hoshitsuki Hikari Dattara, Murakami Momoko, Nagasaki Yukio, Nagatsuka Takuma, Nakamura Hayato, Namikawa Daisuke, Nanri Furea, Nekochi, Nishi Hiroko, Nishina Kazuki, Norizuki Jin, Ojamajo Doremi, Okama, Okamoto Nobuhiko, Ookubo Rumi, Ooruri Ayami, Otobe Yoshihiro, Penguin sensei, Pretty Rhythm, Pretty Rhythm Aurora Dream, Pretty Rhythm Dear My Future, Pretty Rhythm Miniskirt, Pretty Rhythm Rainbow Live, Pripara, Rabichi, Renjouji Bell, Rinne, Saitou Souma, Sakuma Rei, Sakura Ayane, Saori Goto, Segawa Onpu, Seki Toshihiko, Serizawa Yuu, Shi Yoon, Shibata Risa, Shijimi Karin, Shishido Rumi, Shou, Showtaro Morikubo, So Min, Soumi Yoko, Sugita Tomokazu, Suzuno Ito, Takamine Anna, Takamine Mion, Takamine Pietro, Takamori Natsumi, Takanashi Otoha, Takayama Minami, Takeuchi Shunsuke, Takigawa Jun, Terashima Junta, Tomatsu Haruka, Toudou Hibiki, Toudou Kanon, Tsubota Fumi, Tsuda Minami, Uchida Maaya, Uchida Yuuma, Watanabe Akio, Wataru, Yamao Yamada, Yamazaki Moe, Yashiro Taku, Yoda Ken, Yonezawa Madoka, Yong Hwa, Yoshida Shoichi, Yuasa Kaede, Yunsu, 吉田昇一 on September 11, 2016 by rockmanshii. Remainder this book was released 31st of July 2014. I finished translating this around 5 days ago, but some IRL things happened. I was also engrossed into Persona 5 things and translating people’s impressions from the demo events. This is a design related interview, so I scanned all 4 pages of it so you can see the designs. Instead of directly uploading the pages here, I uploaded them on my puush to save space on this blog. Except for the 1st page. My own comments or explanations are under parenthesis. This entry was posted in Opinions on..., Pretty Rhythm and tagged Ageha Mia, Akaii Meganee, Akao Deko, Akesaka Satomi, Amamiya Rizumu, Amamiya Ryuutarou, Amou Juné, Anime, Aoi Shouta, Aoyama Touko, Asada Nikki, Asechi Kei, Asechi Kyouko, Asumi Kana, Ayase Naru, プリティーリズム, プリティーリズム女児用パンツ, プリリズ, Bearchi, Callings, Chae Kyoung, Chiba Shigeru, Chiba Susumu, Denpagumi, Don Bombie, Enoki Azusa, Fujita Yoichi, Fukuhara An, Gotou Saori, Hara Sayuri, Harune Aira, Harune Eru, Harune Hiroshi, Harune Itsuki, Harune Omi, Harune Uru, Hatanaka Tasuku, Hatano Wataru, Hayami Hiro, Hayamizu Risa, Hidaka Noriko, Higarashi Masashi, Himuro Hijiri, Hishida Masakazu, Hye In, Itou Kanae, Iuchi Shuji, Jae Eun, Jounouchi Serena, Kakihara Tetsuya, Kanzaki Sonata, Kato Emiri, Katou Tome, KENN, Kim Hyang Ri, KING OF PRISM by PrettyRhythm, Kinpri, Kojima Nobuto, Komatsu Mikako, Kondou Takashi, Kumai Motoko, Kurisu Kaname, Kurokawa Rei, Kurosaki Maon, Kuwashima Houko, Kyougoku Takahiko, Maeno Tomoaki, Masuda Toshiki, Mieno Hitomi, Mihama Kouji, Miki Shinichiro, Mishiru, Miyake Kenta, Miyake Marie, Miyama Reina, Morizono Wakana, Moshi Watashi Ga Hoshitsuki Hikari Dattara, Murakami Momoko, Nagasaki Yukio, Nagatsuka Takuma, Nakamura Hayato, Namikawa Daisuke, Nanri Furea, Nekochi, Nishi Hiroko, Nishina Kazuki, Norizuki Jin, Ojamajo Doremi, Okama, Okamoto Nobuhiko, Ookubo Rumi, Ooruri Ayami, Otobe Yoshihiro, Penguin sensei, Pretty Rhythm, Pretty Rhythm Aurora Dream, Pretty Rhythm Dear My Future, Pretty Rhythm Miniskirt, Pretty Rhythm Rainbow Live, Pripara, Rabichi, Renjouji Bell, Rinne, Saitou Souma, Sakuma Rei, Sakura Ayane, Saori Goto, Segawa Onpu, Seki Toshihiko, Serizawa Yuu, Shi Yoon, Shibata Risa, Shijimi Karin, Shishido Rumi, Shou, Showtaro Morikubo, So Min, Soumi Yoko, Sugita Tomokazu, Suzuno Ito, Takamine Anna, Takamine Mion, Takamine Pietro, Takamori Natsumi, Takanashi Otoha, Takayama Minami, Takeuchi Shunsuke, Takigawa Jun, Terashima Junta, Tomatsu Haruka, Toudou Hibiki, Toudou Kanon, Tsubota Fumi, Tsuda Minami, Uchida Maaya, Uchida Yuuma, Watanabe Akio, Wataru, Yamao Yamada, Yamazaki Moe, Yashiro Taku, Yoda Takeshi, Yonezawa Madoka, Yong Hwa, Yoshida Shoichi, Yuasa Kaede, Yunsu, 吉田昇一 on August 3, 2016 by rockmanshii. As expected this is movie of the decade. This entry was posted in Opinions on..., Pretty Rhythm and tagged Ageha Mia, Akaii Meganee, Akao Deko, Akesaka Satomi, Amamiya Rizumu, Amamiya Ryuutarou, Amou Juné, Anime, Aoi Shouta, Aoyama Touko, Asada Nikki, Asechi Kei, Asechi Kyouko, Asumi Kana, Ayase Naru, プリティーリズム, プリリズ, Bearchi, Callings, Chae Kyoung, Chiba Shigeru, Chiba Susumu, Denpagumi, Don Bombie, Enoki Azusa, Fujita Yoichi, Fukuhara An, Gotou Saori, Hara Sayuri, Harune Aira, Harune Eru, Harune Hiroshi, Harune Itsuki, Harune Omi, Harune Uru, Hatanaka Tasuku, Hatano Wataru, Hayami Hiro, Hayamizu Risa, Hidaka Noriko, Higarashi Masashi, Himuro Hijiri, Hishida Masakazu, Hye In, Itou Kanae, Iuchi Shuji, Jae Eun, Jounouchi Serena, Kakihara Tetsuya, Kanzaki Sonata, Kato Emiri, Katou Tome, KENN, Kim Hyang Ri, KING OF PRISM by PrettyRhythm, Kinpri, Kojima Nobuto, Komatsu Mikako, Kondou Takashi, Kumai Motoko, Kurisu Kaname, Kurokawa Rei, Kurosaki Maon, Kuwashima Houko, Kyougoku Takahiko, Maeno Tomoaki, Masuda Toshiki, Mieno Hitomi, Mihama Kouji, Miki Shinichiro, Mishiru, Miyake Kenta, Miyake Marie, Miyama Reina, Morizono Wakana, Moshi Watashi Ga Hoshitsuki Hikari Dattara, Murakami Momoko, Nagasaki Yukio, Nagatsuka Takuma, Nakamura Hayato, Namikawa Daisuke, Nanri Furea, Nekochi, Nishi Hiroko, Nishina Kazuki, Norizuki Jin, Ojamajo Doremi, Okama, Okamoto Nobuhiko, Ookubo Rumi, Ooruri Ayami, Otobe Yoshihiro, Penguin sensei, Pretty Rhythm, Pretty Rhythm Aurora Dream, Pretty Rhythm Dear My Future, Pretty Rhythm Miniskirt, Pretty Rhythm Rainbow Live, Pripara, Rabichi, Renjouji Bell, Rinne, Saitou Souma, Sakuma Rei, Sakura Ayane, Saori Goto, Segawa Onpu, Seki Toshihiko, Serizawa Yuu, Shi Yoon, Shibata Risa, Shijimi Karin, Shishido Rumi, Shou, Showtaro Morikubo, So Min, Soumi Yoko, Sugita Tomokazu, Suzuno Ito, Takamine Anna, Takamine Mion, Takamine Pietro, Takamori Natsumi, Takanashi Otoha, Takayama Minami, Takeuchi Shunsuke, Takigawa Jun, Terashima Junta, Tomatsu Haruka, Toudou Hibiki, Toudou Kanon, Tsubota Fumi, Tsuda Minami, Uchida Maaya, Uchida Yuuma, Watanabe Akio, Wataru, Yamao Yamada, Yamazaki Moe, Yashiro Taku, Yoda Takeshi, Yonezawa Madoka, Yong Hwa, Yuasa Kaede, Yunsu on June 26, 2016 by rockmanshii.